I received this comment from Maryam Ayyad's brother Sami. I wrote about Maryam in a post yesterday. May her memory be eternal and may God Bless her family in their time of sorrow. I am the brother of Maryam Ayyad whom she was murdered by the cowards Israeli Soldiers. I describe them as PIGS who killed a woman, grandma, armless, civilian, at her home, in the last days of Ramadan. Are the JEWS and Israelis have License from GOD to kill us! My message to the Palestinian Leaders, whom two of them from our town Abu Dees, Shame shame, shame. When we will wake up?. Israel took more than 75% of West Bank, we could not go from Abu Dees to Ramallah or to Bethlehem or Jericho till we pass through 5 to 10 check points (if we are lucky), The wall became reality where we could not visit Jerusalem from Abu Dees, even some part of abu dees, as well as many other villages, towns and city's became splited, meanwhile the authority and our leaders still believes that Bush will do something in his last 4 months. And to the Arab Leaders, when they will wake up.? I don't think we will ever wake up.Our situation is miserable. Fatah and Hamas must and should solve the differences which will help our cause.The Arab country's traded the Palestinian issue and problem on their Politics and agenda's, and after they accomplished some of their financial GOALS, they left us alone and they want to mediate between us and the Israelis who have the 5th largest army, meanwhile Arab country's starve the west bank and Gaza. Shame, Shame, Shame, Shame, Shame on All Arab Leaders. Let me include All Muslim Leaders too.They killed my dear sister Maryam at her house, the coward soldiers killed her in cold blood. I know that my sister Maryam was not the first and will not be the last in this struggle with the Zionists,but I assure all, that Israel has my the Blood of my sister Maryam (Umm Naser) on their hands. 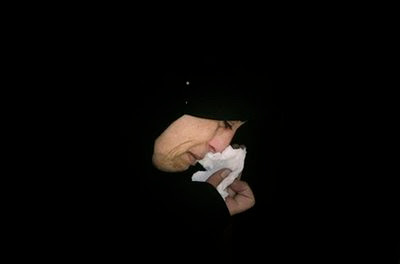 "'Dozens of soldiers came yesterday evening to our apartment building, supposedly in order to kidnap students of the Al Quds University who live in the same residential building we live in', Hiba stated. 'When the soldiers got to the floor where my brother lives with his wife and children, my mother told them that her daughter in law is alone at home with her kids. “Please, for God’s sake do not go in there, leave them alone, the kids will be terrified”, the mother told them.'" Mariam "suffered a fracture in her lower skull which also led to a brain hemmorrhage." The Jordan Times reports, "Nesrin Jasan, an Abu Dis doctor who examined Ayyad for a medical report, said: 'The cause of death was being pushed to the ground and being struck in the head.'" Mariam Ayad of Abu Dis was sixty years old. She was the mother of Hiba and also Fida. She may have had other children as well. There is not much coverage of her horrible death from the soldiers of the Fourth Reich. Israel continues to destroy Palestinian lives, families, homes, society, and culture. The only recourse for Palestinians is to remain steadfast in the wake of Israel's evil.